Often, I receive comments from new bloggers (or people in general) that it’s easy for me to build a blog because “I don’t work full-time outside the home”. Yes, currently I’m a professional blogger which means I work at home on my blog. This means all of my “work time” is spent on my blog. But it wasn’t always like this – not even close. I built my blog while working full-time! I started Organize Yourself Skinny in March 2011, – as of today, that’s almost 7 years ago! Wow, it’s incredible how much has changed since then. Anyway, I didn’t quit my job and start professional blogging until August 2014. This means I worked on my blog 3 ½ years before making enough money to quit my job. 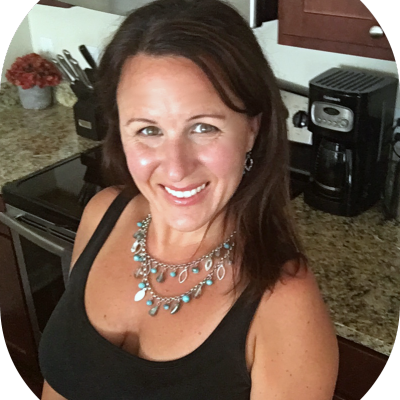 When I started blogging I was working full-time outside the home for 3 ½ years! Not only was I working 40+ hours a week many of those hours were nights and weekends. To make it more interesting my girls were younger then (6 and 4 years old) and I was married (yes, I said was). My point is life was very different back then. It was busy, chaotic, and there wasn’t a lot of time. However, I still managed to build a successful blog. In fact, I quit my state job 3 years after hitting publish on that first post. By the way, handing in my resignation was one of THE BEST feelings of my life. No regrets and I never looked back. If working full-time is holding you back from pursuing your dream as a professional blogger then I’m here to give you that extra push because it can be done. I’m living proof that anyone can start a blog while working full-time. I’m not saying it’s easy, or not going to take time, but if you want it bad enough then you can make it happen. I want to share some of the tips and strategies I used to build my blog while working full-time. Of course, your job might be different than the one I worked but there’s always a way. I truly believe that if it’s important then we make it a priority, if it’s not then we make excuses. Before I get into strategies I want to mention a little bit about the number of hours it takes to blog. When I first started I didn’t work on my blog more than 15 hours a week – that’s all the time I had – and some weeks it was much less. Today, I work between 20 – 30 hours a week. So, in my experience I didn’t need to put in 40+ hours of grueling work to see a profit – I needed to work smart. Yes, just like with any business, the more you put into it the more money you make. Actually, that’s one of the things I love about owning my own business, I’m rewarded for my hard work. Unlike my former job where no matter how hard I worked I NEVER made more money. Anyway, I think it’s important to note that you can have a profitable blog without working long hours every single day. The only time I’ve put in longer hours is when I was creating my ecourse or working on a sponsored post for a company. So, even if you only put in 5 hours a week there’s still a lot of potential to create a profitable blog. Remember, work smarter not harder. This is so important and honestly one I struggled with at first. Prior to starting Organize Yourself Skinny I was all over the place. I wanted so bad to be my own boss and tried just about everything. I sold gymboree clothes on eBay, wrote for random websites, and started a couple other blogs. At one point I was doing all that while trying to start Organize Yourself Skinny. My brain was completely scattered and I wasn’t giving 100% to any of these endeavors. This means the hamster wheels were going but nothing was happening – it was so discouraging. Looking back, I did learn from those experiences but I wasted a lot of time and energy having my eggs in too many baskets. Eventually (about 6-8 months into starting Organize Yourself Skinny) I decided to remove all other distractions and give Organize Yourself Skinny 100% of my focus. This was hard for me to do because I’m slightly ADHD. However, I knew bouncing between 3-4 different business ideas was not going to work. Don’t forget, I was also working full time so what little time I had was shared between a bunch of ideas that were going nowhere. It was literally painful to shut down everything but Organize Yourself Skinny – but I did it and glad I did. Once I focused completely on Organize Yourself Skinny is when I saw growth. 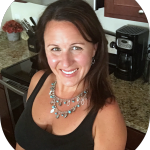 I started to write more, create new recipes, and build a community of readers. This is when the money started to trickle in. If you have a bunch of different blog or business ideas cluttering up your mind I encourage you to pick the business that you’re most passionate about and focus on that. Get rid of everything else. Give your time to the business idea that’s going to bring you towards your goals. #2. Carve out time each week to work on it. The biggest issue with working full-time and starting a business is finding the time. Makes sense. Between 40 hours a week, taking care of a house, yourself, and everything in-between it’s near impossible to find extra time for anything. Trust me, I get it. But here’s the thing, a successful blog is not going to write itself. If becoming a professional blogger is important then you need to make it a priority. This means carving out time each week to work on it. Like I said earlier, you don’t need to spend an extra 30 hours a week on it (although if you have that much time then go for it). Even just 3-5 hours a week can jumpstart your blog. When I started to blog I’d write blog posts before work, on my lunch break, and after the kids went to bed. I’d also wake up early on the weekends and get in some writing before everyone woke up. If I didn’t have other errands to run I would write while my girls were at dance class. Recipe development was done on the weekends too. Anytime I had a little extra time I was working on my blog. My advice is to put together a blogging schedule even if it’s only for a few hours. Don’t wait for time to open up, instead look at your schedule on Sundays and plug in a few work times during the week. Do this every week so you are consistently working on building your business. When you’re a professional blogger you’ll have all day to work but when you’re starting out most of your work will be done in the early mornings, lunch time, or late at night. Now that you have a schedule you need to protect that time! This was a big one for me – still is! Unfortunately, I get distracted easily. This is definitely not a good habit to have as a professional blogger but, thankfully, it’s one I’ve learned to managed. I don’t answer any phone calls during work hours, unless it’s from my kids school. Also, I don’t schedule anything during times I plan to get work done. For example, if I have 6pm – 9pm to work then I’m not going to schedule a hair appointment or dinner date. I know some things are beyond our control but once I learned to protect my time I was able to be more productive. If you have children, or someone else to care for, then you’ll need to work with your spouse, partner, or a family member to help identify blocks of times that work. Like I said, a lot of the work can be done in the morning or at night, when everyone’s asleep, but if you can squeeze in a 3+ hour block of uninterrupted time during the week that’ll be helpful. #3. Be ready to work. With time being so limited you need to make the most of the time you have and that means being ready to work. The last thing you want to do is spend 1 hour of your 3 hour time slot staring at your computer having zero clue what to do. These are the steps I take so I’m ready to work when I sit down at my computer. Make sure my computer is charged. I know this sounds basic, and it is, but I’m embarrassed to admit the number of times I went to work only to find out my computer is at 10% and I don’t have access to an outlet. When I’m home this isn’t an issue but when I’m at Panera or another coffee shop this is a problem. I set specific goals with timelines. When I first started I was focused on writing content so my goals centered around that. Now I have other blog projects on top of writing content that I need to work on. For example, ecourses, newsletters, email courses, among other things – it’s very easy to get overwhelmed. I find it helpful to list out monthly goals and then break it down by the week. Most of the time it takes me longer than I thought but at least I know what needs to get done as soon as I sit down. Create an editorial calendar with monthly themes and topic ideas. I do this in the beginning of the month. In an ideal world I’d like to have 3 months done at a time but I’m happy with 1 month of topic ideas. This way when I sit down I know exactly what to write about and can get started immediately. Create a project calendar. With a project calendar I take one of the projects I’m working on, break it down into tasks, and then give it a timeline. Again, I typically take longer than I think but having a project broken down into a task list keeps me focused and moving forward. It also helps to keep a big project from becoming too overwhelming. Again, protect time and remove distractions. If I only have 3 hours to work then I need to make the most of that time. This is one of my favorite productivity tips. Basically, this means doing similar tasks during one block of time. Here’s an example on how I batch work recipes. The first day I’ll cook and photograph all the recipes – I typically will do between 4-6 recipes in a day. After I’m done with the recipes I’ll edit the photos and calculate the nutritional information. All of that takes me about 6 hours. The next 1-2 days I’ll write up and schedule all the recipes onto my blog. I do the same with writing emails and blog posts, scheduling social media, and working on other projects. By grouping similar tasks together my brain can focus on one task or project at a time. In my experience, I’m more productive this way. This is HUGE. Scheduling blog posts, email, and social media in advance is one of the best things I did to become a more productive blogger. Prior to scheduling I felt like I was on this hamster wheel doing the same blogging tasks over and over again. Once I started to batch work and THEN get chunks scheduled ahead of time I was able to free up more time to work on other things and get ahead of the game. Scheduling blog tasks ahead of time is also super helpful when emergencies pop up or you don’t have the time to blog that week. Or maybe you just want to take a vacation or break? By scheduling everything ahead of time you can make it seem like you’re still there even if laying on the beach. So you’re probably wondering how to schedule things ahead of time. I use a few different services. To schedule email newsletters in advance I do that right in my email service provider Convertkit. I use Tailwind for Pinterest, Coschedule for Facebook, and blog posts can be written out and schedule right in WordPress. Coschedule provides an editorial calendar so you can see all your blog and facebook posts scheduled in advance. This makes it easy to move things around. Of course most of these services costs money, so I understand if it’s not feasible at first. However, if there’s one service I highly recommend investing in right from the start it’s an email list. You can see the other resources I recommend on the resource page. There are many different daily blogging tasks you can do. However, the biggest question you need to ask is “What’s my return on investment (ROI)”. Meaning, what’s going to give you the most money for your time? With blogging you’re not going to see an immediate financial return and it might take a little time to answer that question but pay attention. If you spend 4-5 hours scheduling Facebook and most of your readers come from Pinterest or Google then THAT’S where your time should be. What do your readers want to read? What going to help you build that relationship? What’s going to bring in the most traffic? You might be wondering where to find these answers? Right here –> Google Analytics and Google Search Console. After a few months of writing content you’ll be able to see exactly what your readers are searching to get to your site and what they’re reading. If you don’t have Google Analytics or Google Search Console set up I highly recommend stopping whatever you’re doing and install it right now. Both will give you an enormous amount of information so you know exactly where to spend your time. You don’t want to blog blind – you need to know what’s working and what needs improving. I made a lot of mistakes when I first started Organize Yourself Skinny but because I was able to recognize my blogging shortcomings I was able to improve, evolve, and change. This eventually led to the profitable blog I run today. The beauty about starting a blog today, compared to when I did, is there is so much information out there now. I would even argue too much. Nonetheless, if you have questions about any aspect of blogging, more than likely, you’ll find exactly what you need with a quick internet search. There are also numerous ecourses available to walk you through the entire blogging process. When I first started there were a couple bloggers sharing their experiences, but most of my learning came from trial and error. I don’t want you to get overwhelmed with all the information available but I do think you should use it to your advantage. Professional blogging takes time and effort but I do think it’s easier to start a profitable blog today than it was years ago – even if you are working full-time. My advice is to take time each week and learn something new about blogging and put those strategies into practice. Pay attention to what works and what needs to be tweaked. Keep in mind you’re not going to see results overnight. Most blogging strategies take at least a month to work so don’t get discouraged. There isn’t a magic bullet to starting a blog while working full-time. It takes commitment, persistence, and patience. You have to be okay with failing a few times, starting over, and putting in a lot of hard work with minimal results at first. However, it’s completely possible. If you’re willing to put in the work, and see it through, I can tell you the reward is better than anything you could ever imagine. There’s no greater feeling in the world than quitting a thankless job to thrive as your own boss. If I can do it, then I know you can too. 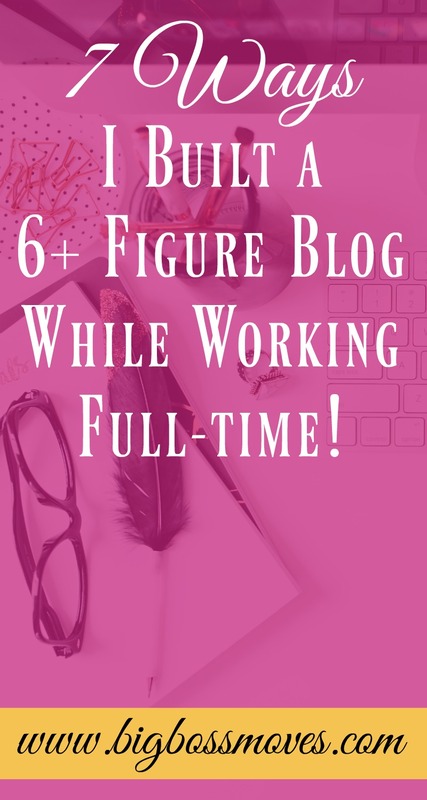 Are you currently working full-time while trying to start a blog? What are your questions? Do you have any tips to share?